Credit: Courtesy of Sharon Bickel, Dartmouth College. For women in their 30s and beyond, the probability of a pregnancy that results in a miscarriage or a Down syndrome pregnancy is staggering with the risk increasing to 1 in 3 by the time a woman reaches her early 40s due to the "maternal age effect," the high incidence of mistakes in chromosome segregation that occur during the cell division process of meiosis, which gives rise to the egg. Now, in a study just published online in the PNAS (Proceedings of the National Academy of Sciences), Dartmouth researchers have provided the first evidence in an intact living organism that an increase of reactive oxygen species (ROS) within oocytes (the cells that undergo meiosis to form eggs) causes a significant increase in meiotic chromosome segregation errors. One hallmark of aging cells is an increase in the damage of cellular components due to ROS, oxygen molecules that have picked up an extra electron that makes them highly reactive and damaging. Dartmouth's study illustrates how oxidative damage may contribute to the maternal age effect, a hypothesis that was first put forward over 20 years ago. During meiosis, chromosome pairs perform a highly choreographed dance in which they first come together and then move apart into the cells that will eventually form an egg. 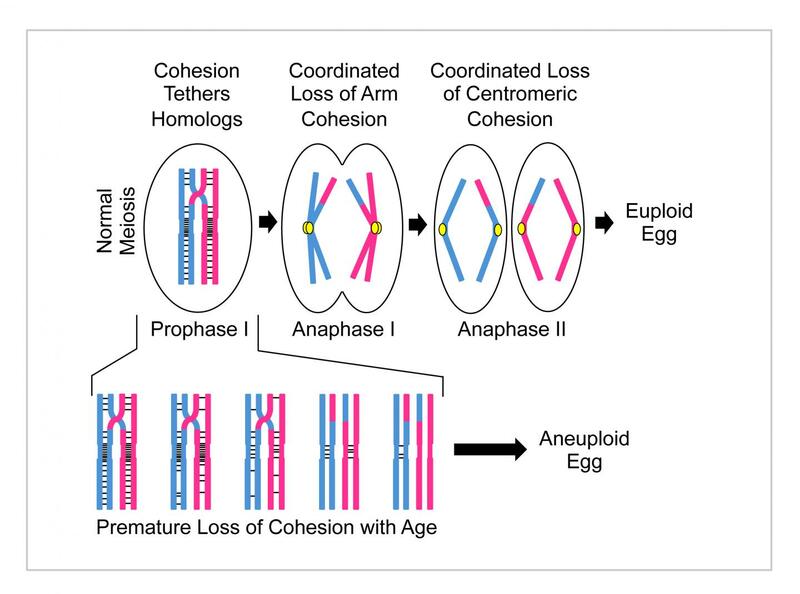 Accumulation of oxidative damage in the aging human oocyte could disrupt this process, causing a failure of chromosome pairs to segregate accurately. A failure of chromosome pairs to segregate accurately leads to Down syndrome when the egg inherits two copies of chromosome 21 (instead of one copy); after fertilization, this leads to an embryo with three copies of chromosome 21 (Trisomy 21). One critical aspect that governs accurate chromosome segregation is something called sister chromatid cohesion. Cohesion refers to protein-mediated physical linkages that hold sister chromatids together. In meiotic cells, cohesion between sisters also holds a chromosome pair (recombinant homologs) together and helps to ensure that the pair segregate accurately during the first meiotic division. If cohesion is lost prematurely, the probability that chromosomes will undergo segregation errors is much higher. The work conducted at Dartmouth has now shown for the first time that increased levels of ROS in the oocyte result in premature loss of meiotic cohesion, which then leads to segregation errors. Similar to other geneticists, Bickel and her team used the fruit fly for their research. To investigate the role of ROS levels during meiosis, they applied genetic techniques to decrease the proteins that normally neutralize ROS, to experimentally increase ROS levels within the oocytes of a living female fruit fly. The researchers then looked at the female fruit fly's offspring to quantitatively measure how often chromosome segregation errors occur within its oocytes. "Not only does our work provide insight into a phenomenon that negatively affects pregnancy outcomes, it also raises the exciting possibility that approaches that slow down the accumulation of oxidative damage could lower the incidence of chromosome segregation errors in the oocytes of older women," says Sharon Bickel, associate professor of biological sciences at Dartmouth. "This is the most important work of my career," she added. Based on these findings, one possibility is that a diet rich in antioxidants may be able to slow the age-related demise of meiotic cohesion. Bickel's lab plans to test this hypothesis, by feeding fruit flies antioxidants and measuring whether the increase in segregation errors that they have previously observed in "aged" oocytes can be suppressed by dietary interventions. This future study reflects the lab's broader focus on defining the pathway of events necessary for chromosomes to "do the right thing" during meiosis. Sharon Bickel is available for comment at [email protected] Dartmouth graduate students Adrienne T. Perkins and Lauren C. Panzera and former Dartmouth undergraduate Thomas M. Das served as co-authors of the study.